Last modified on February 22nd, 2018. On Innoslate's 'Manage Projects' page, you have the option to filter your existing projects using the left side-bar's 'Filter' tab. 'All' Selecting 'All' will show you all of your existing projects. 'Active Projects' Selecting 'Active Projects' will filter your view to only show your most-recently accessed active projects. 'Owned by You' Selecting 'Owned by You' will filter your view to only show projects that you've created in Innoslate. 'Shared with You' Selecting 'Shared with You' will filter your view to only show projects that have been shared with you by other users. 'Folders' Under 'Folders' you will see a list of all of the existing project folders and how many projects are saved in each. You can select any folder name to filter your view to only show projects within that folder. On Innoslate‘s ‘Manage Projects’ page, you have the option to filter your existing projects using the left side-bar’s ‘Filter’ tab. ‘All’ Selecting ‘All’ will show you all of your existing projects. ‘Active Projects’ Selecting ‘Active Projects’ will filter your view to only show your most-recently accessed active projects. 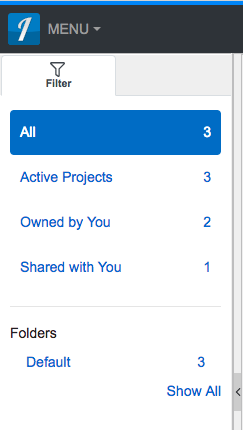 ‘Owned by You’ Selecting ‘Owned by You’ will filter your view to only show projects that you’ve created in Innoslate. ‘Shared with You’ Selecting ‘Shared with You’ will filter your view to only show projects that have been shared with you by other users. ‘Folders’ Under ‘Folders’ you will see a list of all of the existing project folders and how many projects are saved in each. You can select any folder name to filter your view to only show projects within that folder.